Successfully Added Android 5.1 TV Box - Wi-Fi, Bluetooth 4.0, H.265 Decoding, HDMI 2.0, KODI Support to your Shopping Cart. Want to watch the latest movies, shows and series, surf the Web and enjoy the latest apps on your big TV screen? It’s easier than ever before with this Android 5.1 TV box. The compact device will make your TV smart in an instant and let you experience all the benefits of Android’s friendly user interface. One of the distinctive features of this TV box is its powerful Amlogic S905 quad-core processor – ensuring smooth operation and giving you lots of muscle for multitasking. Featuring one of the latest Android operating systems – Android 5.1 – the TV box will let you get all the latest apps and tools from the Play Store for even more functionality. With Kodi support, you will have a great responsive interface for watching all your media and smooth control of the playback. With Miracast, DLNA and Airplay, you’ll have lots of options at your service. 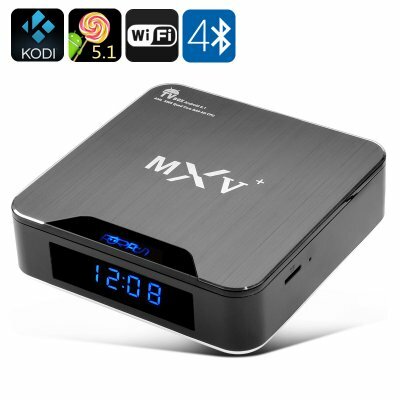 The TV box sports great connectivity and offer Wi-Fu and Bluetooth support in addition to its 3 USB ports, HDMI 2.0 output and micro SD card slot. Thanks to H. 265 encoding, all your files will be efficiently stored on the card or TV box and won’t take up too much space. You will have 8GB on the TV box itself + up to 32GB externally. The Android 5.1 TV Box comes with a 12 months warranty. Brought to you by the leader in electronic devices as well as wholesale Android TV boxes..